This jacket has it all: style, fit, and comfort. 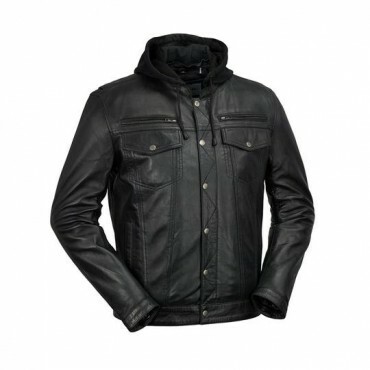 With a removable hood and two zippered chest vents, this jacket can be worn in all seasons. Style WBM2760Details and Fit100% sheepskinClassic fitSnap and zip sleeveFully linedTwo chest pockets, two hip pockets, one interior pocket..
Sleek and striking in midnight blue. This center zip jacket is accented by a geometric kidney belt. Available in blue.Style WBM2190 Details and Fit100% sheepskinClassic fitZip sleeveFully linedTwo hip pockets, one interior pocket..
Cruiser | LM-WBM2103 Details and Fit100% lambskinClassic fitSnap and zip sleeveTwo chest pockets, two hip pockets, one interior pocket..
Esquire | LM-WBM6003Details and Fit100% sheepButton cuffsFully linedOne chest pocket, two hip pockets, two interior pockets..
Iconoclast | LM-WBM2153 Details and Fit100% lambskinClassic fitSnap and zip sleeveFully linedTwo chest pockets, two hip pockets, one interior pocket..
Indiana | LM-WBM2058 Details and Fit100% cowClassic fitZip out linerTwo chest pockets, two hip pockets, one interior pocket..
Maddox | LM-WBM2084Details and Fit100% sheepskinClassic fitSnap and zip sleeveTwo chest pockets and two hip pockets..
Maine | LM-WBM2052 Details and Fit100% cowhideClassic fitSnap and zip sleeveTwo chest pockets, two hip pockets, one interior pocket..